Heavy equipment moving a talus deposit uncovered about 100 items, including the remains of a child. The context of “burial assemblage” is important for deriving information from the collection. In 1968, Dan Busse was working along a narrow strip of previously unbroken native grassland. Recent rains had washed a small hole at the edge of the remaining grass, where Dan noticed a fingernail-sized glint of jasper. Further exploration revealed a large cache of tools and bifaces made from Smoky Hill jasper and buried under up to a meter of soil. The cache itself had a very limited distribution. Artifacts were touching, or nearly so, in a pattern resembling a spill. The 24 pound load would not have been carried as a compact cube, but more likely would be configured to fit the carrier’s back. That kind of pack load could appear to be spilled if not recovered and mapped carefully. The apparent breakage of items at the time of deposit and apparent retention of the travel pack suggests a hasty deposit that might have damaged the contents. The cache location near Little Beaver Creek is basically on a historical trade route reaching between New Mexico and North Platte, Nebraska. While the High Plains are devoid of running water, a series of streams emerge along the perimeter, forming what may be thought of as a river ladder that let people travel north and south without being far from water. Today, the nearest source of Smoky Hill jasper, part of the Niobrarra formation, is 50 or 60 miles south of the site, where chert seams have been reported as thick as 6 inches. That location is also the westernmost outcrop of Smoky Hill jasper. About the same distance to the northeast at Cambridge, Nebraska, gravel operations have uncovered quantities of large jasper 60 feet below the present river level. It is possible that sources exploited in Clovis times are not visible now. Steve Holen examined the geologic context of the site and found that it was on the margin of the third terrace, which had stabilized during Clovis time because of a natural rock dam a short distance downstream. Vance Haynes drilled a core sample at the site and found clean gravel underlying it, indicating that a spring may have carried enough water to clear the fine sediments. Combining the possible spring with a natural dam means that the site may have been a good watering place for both people and animals. Contents of the cache are what should be expected in a routine travel pack—not an emergency store, or surplus, or burial. This may be a “woman’s” pack, in that it is oriented toward butchering needs as opposed to hunting weapons. Several very large bifaces in the cache were poorly shaped and unevenly edged. 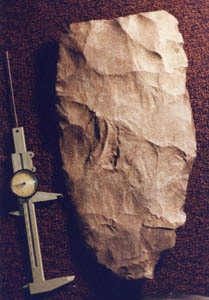 One tip of a large biface had carefully trimmed and sharpened edges, matching the appearance of other known Clovis biface caches. The Smoky Hill jasper sources seldom provide solid sections much over two-inches thick. 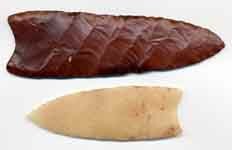 One biface was deliberately broken in two to provide blanks to make into projectiles, but both segments remained. First, a deep, wide notch was made along one edge, about a third of the total length from the tip. A blow within the notch then sent a break on a diagonal to the opposing edge, to exit near the biface base. Two projectiles, about two thirds the length of the biface length, could have been made from the remaining portions. My speculation is that to section the biface after notching would require supporting the biface on edge, with the tip upwards and striking the notch face in roughly the direction a split was desired. The same strategy occurs in the Anzick Clovis cache from Montana. 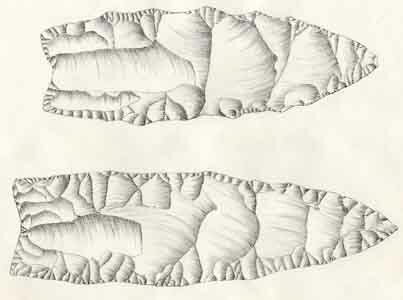 Phil Wilke has commented on this as an example of a culturally specific way of sectioning a biface platter. Another biface allowed refitting at least two large, opposing bifacial thinning flakes. Measurements of scar depth predicted a thickness of 8 mm, only slightly less than the actual thickness of flakes at that location. A narrow biface that had reached an advanced stage of reduction showed at least one near-overshot flake scar. A large divot near the overshot apparently represents an accidental break by a sharp blow perpendicular to the face. Since flakes can be refit to reconstruct the damaged portion, the breakage has to be attributed either to damage at time of deposit or after discovery. At least two broken bifaces appear to have been broken before discovery and retained in the pack load, further supporting a hasty deposit of the cache. Both these bifaces had serious problems with buried cracks and cortex remnants that interfered with knapping. The largest biface is about 24 mm thick, and shows signs that it is not much thinner than the tabular source. Biface shapes tended to be roughly tapered symmetrically to either end. The largest biface, however, is widest near the base. Biface flakes show battering in preparation to control the impact location, which is important for controlling flake thickness. Biface surfaces retain signs of ochre, despite the artifacts having been washed in water. Mineral scale adhering to one or both faces of many bifaces testifies to long burial despite the otherwise fresh appearance of the artifacts. A quarter-inch seam of jasper has extensive scratches in the cortex on each face. Too thin to make a good projectile, and difficult to knap without interference from cortex, it appears to be an abrading tool for strengthening platforms. The fact that the edges remain square and unutilized shows that its importance was based on something besides cutting. One large chunk of raw jasper, roughly 2”x 2” x 1 ft, is untouched except for one sample flake at the tip. Too narrow for a biface, this may have been intended as a tool flake core. A large portion of the cache consisted of tool flakes that were much too large to be made from biface flakes. They had to be made expressly at the quarry from edges and corners of tabular material to be suitably thick, primarily by severing corners of tabular source. Others followed the ridge left after both edges were removed. At least one tool represents successive removals from a tabular edge. Orientation of tool flakes relative to the tabular source are revealed by surface cortex and by distinctive color changes between layers in the tabular stone. Tools flakes ranged around 20 mm thick and lengths ranged from two to four inches. Many platforms were so small that no platform surface remains with the flake. Some of the small platforms retained mirror-like polish. At least one corner segment was removed by a hard hammer, off-margin impact to obtain the requisite depth. That example has a very small contact dimple, negligible bulb and expanding concentric rings. It may have been made by a rocker-action stone punch. Two tiny flakes were not of Smoky Hill jasper. One is a yellow dendritic Hartville jasper graver and the other a cloudy-patterned translucent chert. They could have gotten into the collection before Dan Busse realized the importance of keeping the collection apart from other materials, or they could represent remnants lodged in the ancient pack from an earlier foray into Wyoming. A number of other small flakes in the cache buttress the case for knapping debris being trapped and preserved in the pack. Since there are no typically diagnostic projectile points and there are no datable contents, it is difficult to date the cache. 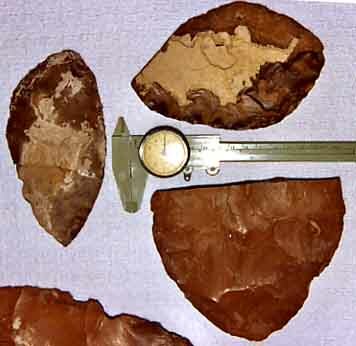 Biface size is an important consideration in determining what culture left the cache. A large load would be burdensome, so we will assume that there are good reasons for choosing such massive items. One possible reason is to provide tool blanks, but only one of the large stones is suitable for making quantities of robust tools. The large bifaces would supply only relatively limited flakes between 6 and 8 mm thick. Otherwise, they could be used as bulky chopping tools or converted into very substantial projectiles. As cleavers, their mass would be most suitable for very large animals like mammoth. As projectiles, they could be turned into Clovis points or Hell Gap points of considerable size. Folsom people seemed to have used much smaller individual pieces of stone. In fact, no other culture is known to move stone in such massive forms for such distances. Sectioning the bifaces would allow several Clovis projectiles to have been made from the cache contents. The specific method of sectioning is known only from Clovis time and so seems to be a useful diagnostic indicator. Clovis cache bifaces from unambiguous contexts demonstrate quite similar size, shape, thickness, and edge refinement. They also tend to have widely spaced flake scars that travel significantly past the centerline to both thin the biface and provide maximum tool flake utility. Blade-like tools are known from many cultures through time. 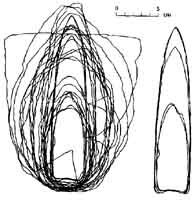 Whether Clovis blade making is especially diagnostic is questionable, but they certainly used heavy blades at many sites. The robust flakes in this collection are particularly thick in relation to exhausted tools recovered from sites representing other cultures. The location of the site on the third terrace does not insure the time frame, but it is much more likely that activity would be conducted on the margins of a stable valley bottom than on the meager remnants of an earlier valley floor perched on the slope. Overshot flakes generally require deliberate planning to avoid disastrous knapping errors. Many early cultures used overshots, but none more readily than Clovis. The lack of more overshots is more likely due to the relatively thin tabular source than to a lack of ability. Platform remnants are especially good at revealing cultural habits. The edge reduction by battering and subsequent heavy grinding before striking the blow are typical for Clovis. Minimal platform remnants show remarkable command of knapping expected from Clovis and Folsom times. Occasional use of hard hammer for thicker blades is perhaps unusual, but should be expected in relation to primary quarry activity. Small bulb formation also indicates competent knapping typical of the earliest periods. Large bifaces with tips carefully tapered to a thin edge at the earliest stage of reduction are somewhat unusual for any time besides Clovis. Folsom knappers left their preform tips blunt to facilitate fluting because they needed to rest the tip on an anvil. In summary, in spite of a lack of the usual diagnostic features, this cache is thought to represent something unwillingly left behind by Clovis era people. 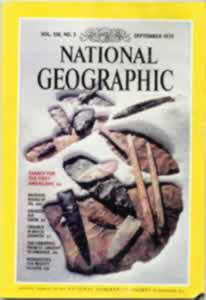 The contents speak to an early stage of routine use and may provide the clearest picture yet into how Clovis peoples procured tools and how their normal pack load was portioned. Eight large bifaces include a 21.5 cm fluted flake blank. Patterns of ochre stain indicate that the bifaces were transported while wrapped with narrow rawhide strips. Thirteen complete projectile points were discovered in a plowed field by Orville Drake while hunting arrowheads. Later investigation showed the presence of a small amount of ivory as well. Spectacularly patterned colors are complemented by superb workmanship. The stone comes from the Alibates quarries in the Texas panhandle. Found in about 1902, the circumstances of the Fenn Cache are clouded. Similarities in flaking style and sets of material from distinct locations provide convincing arguments for the integrity and relatedness of the items. Artifacts are made of stone that had been transported great distances: Agate from east central Utah, Green River formation chert from the Red Desert of Wyoming, Phosphoria chert from the Big Horn Mountains of Wyoming, Obsidian from southwest Idaho, and smokey quartz. A crescent tool in the Anzick cache is identical in form to those used in the Great Basin Archaic period and does not appear in any other Clovis context. The implication is that Clovis people borrowed the idea from contemporaneous people who used another technology with stemmed points. The highest priority was set on evenly spaced flake scars, extending diagonally from edge-to-edge, right-to-left as viewed from the base. Since there is no evident functional advantage, it can be assumed that aesthetic values are of primary importance. Twice as many major flakes are oriented toward the tip as toward the base, although some individual faces show a flaking bias toward the base. Overshots angled to the tip are easier to incorporate into a projectile shape than when an overshot bites away width near the base. This is especially important in that extra width is sacrificed beyond what would be lost by originating flakes from near the tip and angling them toward the base. Flake sequences trend generally from tip-to-base. Sequences from base-to-tip are used on occasion, sometimes counter to the sequence of the opposite face. Flakes are often ordered in end-to-end serial sets of 2 to 8 flakes each. While each serial set may be ordered in the same direction, the order of sets may be in the opposite direction. Control of flake scar morphology depended mostly on using surface isolation but also on adhering to a sequence. Breaks in flake sequence are most likely due to the worker recognizing that continuing work, without developing appropriate surface isolation, would leave an undesirable scar. Remnants of the stage prior to the final, patterned sequence indicates that flakes were carefully positioned to allow maximum travel. Each series of scars was designed to improve on the visual effect of the prior stage. Wide, flaring scars are seen only on early stages, where scar patterns are especially broad. At this stage, surface isolation is more important to flake placement than is scar patterning. Overshot flakes are used persistently until the final projectile thickness is reached. Since overshot flakes require 4 to 5 mm thickness in order to carry reliably from edge-to-edge, once final projectile thickness is attained, overshot flaking is discontinued. Continued flaking after target thickness is reached would lower W/T ratios, interfere with hafting, and weaken the point. Strongest patterning is on the thickest projectile point (plate 1), possibly because there was ample thickness to control the flake pattern. W/T ratios are maintained between 4 and 5 for all but the largest platters, which can have W/T of 8. Fatter forms (W/T below 4) are obviously earlier stages, as is evident from their rough-hewn appearance. Grading operations revealed at least 34 bifaces at various stages of reduction. There were large bifacial flake cores, smaller bifaces, and finished Clovis points, but no bone. Workers found the Richey cache while trenching for irrigation in an orchard near Wennache, Washington. This is the only Clovis cache found in undisturbed context and scientifically excavated. Since not all material was removed, the full extent of the cache is unknown. Bone and ivory rods were present, but no human remains have come to light. Sixty artifacts have been reported. The wavy edges result from minimal retouch to leave the edge as sharp as possible. 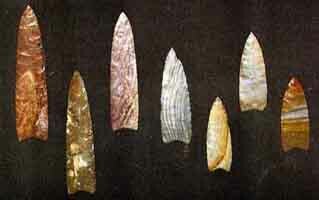 Projectile points are some of the largest known Clovis fluted artifacts. They could be knives or defensive weapons. A cache of three large bifaces and three unfluted preforms held by the Ft. Collins, Colorado museum since 1941 appear to represent a Clovis era cache. The collection was donated by Ira Watts, who farmed land adjacent to the Cache La Poudre River at Timnath, just east of Ft. Collins. One preform is chert while the other bifaces are quartzite. The stone appears to come from the Hartville Uplift near Glendo, Wyoming, about 140 miles to the north. Original appearance of the stone was altered by patination, but damage from farm equipment when the cache was unearthed reveals coloration ranging from lavender to gray. Extreme patination makes it likely that the cache was never deeply buried. Differences in weathering show that the largest biface was most exposed and probably protected the other specimens. 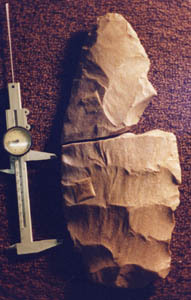 Biface 1 measures 30.3 cm long by 17.7 cm wide and 25 mm thick. Widely spaced major flake removals leave no islands of prior stage work. Expertly controlled percussion left edges sharp and even, without step flakes and did not obscure the major thinning flake scars. While large bifaces are known from other cultures, I know of none besides Clovis that transport the bifaces so far and in such large size. 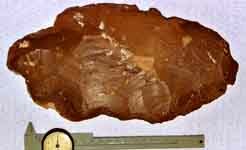 Biface 2, represented by two halves, measures 33.8 cm long by 14.87 cm wide and 27.3 mm thick. The edge of this biface was sharpened and evened with the same care as biface 1. Major flaking scars have removed all traces of prior stages of work. 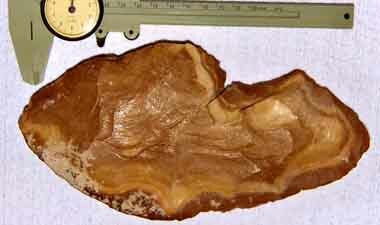 Biface 3 measures 19.1 cm long by 10.3 cm wide and about 15.3 mm thick. Percussion scars are consistent with the large bifaces, but the biface twists about its long axis. No retouch is evident subsequent to the final series of major flake removals. Lack of retouch indicates a priority on obtaining useful flakes. Biface 4 is an unfluted triangular preform measuring 15.7 cm long by 46 mm wide and 15 mm thick. Despite a noticeable twist along the long axis of the biface, the biface could still be converted to a straight projectile point. No flute is present and the ends are tapered skillfully. Edges are even, and closely spaced selective flake scars show no tendency toward overshot. Biface 5 measures 13.8 cm long by 39 mm wide and 12.5 mm thick. This slender triangular preform could easily be from the same quarry stone as biface 2 and is also tapered at the ends, but shows no flute scar. Biface 6 measures 10.3 cm long by 48 mm wide and 13.5 mm thick and is tapered at one surviving end that is interpreted as a face of the original chert quarry blank. Flaking does not show overshot remnants, but is free of step terminations and shows excellent command of surface contour. Apparently, it was curated after a manufacturing error severed the preform tip. The largest bifaces are strongly reminiscent of Clovis bifacing practices, despite lack of diagnostic fluting. No other local culture is known to cache multiple bifaces of such size and quality. The large flake removals would have required heavy batons that are not typical in any other time period. The large bifaces rank with the largest known Clovis-cache bifaces. Although they are slightly thicker than those documented in the Fenn cache from S.W. Wyoming by Frison (1999), a single set of 10-mm flake removals on a face would bring them into conformation. Later stage bifaces are in the same dimensional range as Fenn cache bifaces. Succeeding work usually consists of sectioning the platters for use as projectile preforms (Wilke, et al 1991). Extrapolation from this pattern suggests that the cache may represent storage of surplus items that have lost their utility for providing suitable camp-tool stone. The preponderance of projectile preforms, combined with the lack of tool flakes indicates a possible relative deficit of tool flakes. By caching the surplus projectile preforms in sites remote from other lithic sources, Clovis people may have been creating insurance stores to avoid critical shortages in the future. In this case, the cached stone is at least 140 miles south of its likely quarry source near Glendo, Wyoming. Replacement stone of high quality and easy access existed at the Flattops quarry near Sterling, about 80 miles due east. The preform bases are tapered consistent with morphology needed to accommodate fluting for mounting as projectile points. It is reasonable to suggest that these tools simply had not advanced beyond the camp tool stage of use and would have normally been converted to projectiles by fluting. The lenticular end-to-end contours preclude interpretation of the preforms as part of a Folsom assemblage. End-to-end twists on bifaces 3 and 4 are uncharacteristic of other known bifaces from the Clovis period, but would not have interfered with making a normal, straight-edged, fluted projectile point. Differences in surface patination show that the largest biface was most subjected to weathering and probably protected most of the other specimens. The extreme patination makes it likely that the cache was shallow or even exposed at the time of deposit. By overlaying tracings of each artifact with the patinated face upwards, it is apparent that, at the time of discovery, the cache was oriented with each artifact pointing the same direction. The shared damage from farm equipment does much to confirm that the collection was cached together. When the tracings of individual artifacts are superimposed, the damage can be seen to suggest that the cache was stacked with the largest pieces on top. That interpretation is further supported by the fact that greatest patination is evident on the largest biface. 1999 The Fenn Cache Clovis Weapons and Tools. One Horse Publishing Co., Santa Fe. 1993 The Richey Clovis Cache. Persimmon Press, Buffalo. 1995 The Busse Cache: A Clovis-Age Find in Northwestern Kansas. Current Research in the Pleistocene 12:17-19. 2014 Clovis Caches: Recent Discoveries & New Research. University of New Mexico Press, Albuquerque. 1988 The Drake Clovis Cache. Current Research in the Pleistocene 5:21-22. 1998 The Crook County Clovis Cache. Curent Research in the Pleistocene 15:86-88. 2015 The Hogeye Clovis Cache. Texas A&M University Press.